Those last names are fascinating; as is the entire piece. What wonderful memories, Howard! I joined you in 1960 and the stars were Victor Borge and Jon Vickers. We did a fantastic scene of Johann Strauss Jr. “The Blue Danube”. Thanks so much for bringing back these days/nights for us. Wow! What a great group. Were there ever any recordings made? Diane, I remember that show! I’ll try to do a blog post about it one day. Yes, Richard, luckily the CNE sound people recorded every show from the stage as it was being played. The recordings are currently kept at the CNE Archives building. I had the pleasure of listening to some of them several years ago. The orchestra sounded phenomenal. It warms my heart to see the names of so many of the musicians who were very kind to a young harpist who arrived in Toronto in 1975. Thanks, Howard! Hi Charlotte: Didn’t I book you to play Tony Bennett at the Royal York in 1975? Nice to see you on the blog. Stay in touch. Howard, thank you for sharing this! Yes! Also, you booked me for my very first gig in Toronto–Joey Heatherton at the Imperial Room–for which I got a mention from Wilder Penfield III in the Toronto Star! Thanks again, Howard. I have great memories of Bernie. He was such a key player for me. So good to see you on the blog. Keep in touch. My gosh, WHAT a line-up! So many great memories! I remember Howie Reay in a Beatles haircut and John Lennon glassses visiting Niagara-on-the-Lake. Of course dear friends Bernie and Erich. Peter Appleyard’s good cheer – and Silver Cloud Rolls! The gentle Murray Lauder. Vair Capper with a grey ponytail – and I seem to remember him in overalls?? Did he play for your Theatre in The Square summer series in Gravenhurst? And didn’t Abe Galper draw the wonderful cartoon of you? OK…I was born in 1957 and studied with Abe Galper in 1973 for a few years; and began my “full-time” music career in roughly 1984. It is amazing and I feel very fortunate that so many of those great musicians continued to be active then, and I had the chance to play with them. I have always felt that the time I had playing in the Imperial Room was like ‘graduate school’ after Humber College. Thanks Howard. When I was a student at Humber College (’78 – “80) Ron collier was my arranging and composition teacher, it was a fabulous opportunity to have private time with such a talented and inspirational musician. I’m not sure about Vair’s overalls, but I certainly do remember his ponytail. And yes Abe drew this (and a few other) caricatures of me. One day I’ll make a blog post of all his Cable cartoons. I certainly remember “Count Skublics”. Do you? Ron was a wonderful musician and teacher. One of the best! Richard, if you do get a reply from them in the positive, see if they might be amiable to placing that collection online somewhere like archive.org! Would be an amazing resource to have available. Hi Gary: That era was one of the BEST for hearing the great musicians of our country. So pleased that you were able to experience it. In 1978 Ted Moses recorded the Mother Necessity Big Band, CBC published the album, titles ‘More Than Ever’. I was playing tenor in that band, as well as a regular with Howard at the Royal York. It was fun running from one gig to the next. Really?!! Oh I’d love to hear it! Harvey, any chance you still have a copy of that LP? At least knowing now the name, the years and label (which makes sense, Katherine Moses recorded on CBC as did many others from that social circle) it gives me something to search up. Thanks for this tip! it is also always comforting to have corroboration on the existence of the MNJW; there are times when I begin to think I only dreamed it. I studied at Humber College in 1980 to 1981and went to Don Johnson for breath coaching and he sent me to Nick Kilburn for bassoon lessons. 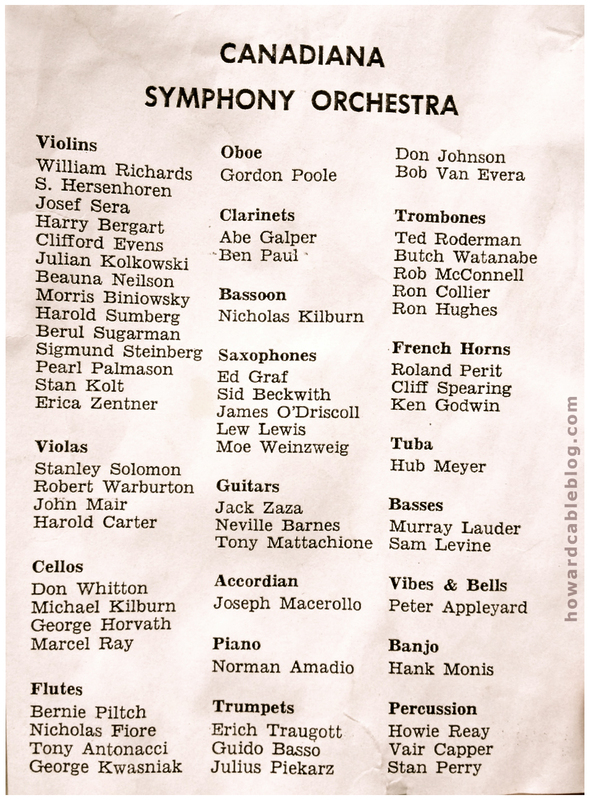 I know the children of many of these players and play a number of Eddie Graf’s arrangements in John Liddle’s bands. My grandfather was Jim O’Driscoll of the Nice and Easy Band. One of the recordings of “what are you doing with the rest of your life” from the CNE was my wedding song. He was long retired once I came along but his music always lived on in our house. So happy to find this.